The Type PMT timer is an adjustable precise time delay control device. 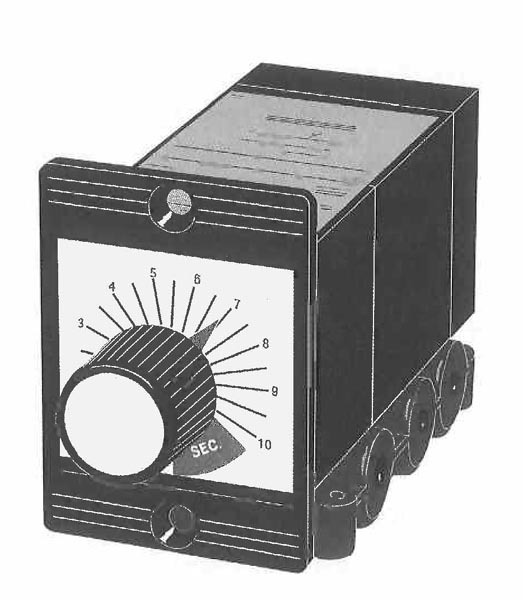 The timer is available with an on delay (NC) logic output. Timing operation is dependent upon the input of a separate control signal which starts the timing sequence by setting a vacuum within the timer. Using atmospheric pressure (independent of line pressure), the timer begins the preset timing cycle. At the end of the cycle an internal 3 way valve is switched providing an output. The timer resets automatically after removal of the control signal. The PMT has a separate subplate enabling the unit to be supplied with 10-32 or 1/8 NPT porting. The timer can be panel mounted with a bezel, or in the rear on a sub plate. Subplate Mounting 0.3 to 3 sec. 15 to 100 psi 2 1/16 in. 1 1/2 in. 4 1/4 in. Subplate Mounting 1 to 10 sec. 15 to 100 psi 2 1/16 in. 1 1/2 in. 4 1/4 in. Subplate Mounting 3 to 30 sec. 15 to 100 psi 2 1/16 in. 1 1/2 in. 4 1/4 in. Subplate Mounting 6 to 60 sec. 15 to 100 psi 2 1/16 in. 1 1/2 in. 4 1/4 in. Subplate Mounting 12 to 120 sec. 15 to 100 psi 2 1/16 in. 1 1/2 in. 4 1/4 in. Subplate Mounting 18 to 180 sec. 15 to 100 psi 2 1/16 in. 1 1/2 in. 4 1/4 in. Panel Mount Vertical Bezel 0.3 to 3 sec. 15 to 100 psi 2 1/16 in. 1 1/2 in. 4 1/4 in. Panel Mount Vertical Bezel 1 to 10 sec. 15 to 100 psi 2 1/16 in. 1 1/2 in. 4 1/4 in. Panel Mount Vertical Bezel 3 to 30 sec. 15 to 100 psi 2 1/16 in. 1 1/2 in. 4 1/4 in. Panel Mount Vertical Bezel 6 to 60 sec. 15 to 100 psi 2 1/16 in. 1 1/2 in. 4 1/4 in. Panel Mount Vertical Bezel 12 to 120 sec. 15 to 100 psi 2 1/16 in. 1 1/2 in. 4 1/4 in. Panel Mount Vertical Bezel 18 to 180 sec. 15 to 100 psi 2 1/16 in. 1 1/2 in. 4 1/4 in. Panel Mount Horizontal Bezel 0.3 to 3 sec. 15 to 100 psi 2 1/16 in. 1 1/2 in. 4 1/4 in. Panel Mount Horizontal Bezel 1 to 10 sec. 15 to 100 psi 2 1/16 in. 1 1/2 in. 4 1/4 in. Panel Mount Horizontal Bezel 3 to 30 sec. 15 to 100 psi 2 1/16 in. 1 1/2 in. 4 1/4 in. Panel Mount Horizontal Bezel 6 to 60 sec. 15 to 100 psi 2 1/16 in. 1 1/2 in. 4 1/4 in. Panel Mount Horizontal Bezel 12 to 120 sec. 15 to 100 psi 2 1/16 in. 1 1/2 in. 4 1/4 in. Panel Mount Horizontal Bezel 18 to 180 sec. 15 to 100 psi 2 1/16 in. 1 1/2 in. 4 1/4 in.